A funeral home is a place of farewells — hence many people visit a funeral home with a heavy heart. It is a place apart — yet it is very close to us. We may not wish to go there but life’s paths are littered with turns we’d rather not take. At our Funeral Home in Kealkill village, we are sensitive to the fact that people may find it difficult to visit a funeral home. It is filled with memories — but these memories may also welcome us. They are memories of our own people. The rites of farewell at the time of a funeral are times of sorrow sprinkled with hope. We have designed our Funeral Home to help people walk the path of grief in a less painful way. We aim to make it comfortable, with appropriate seating, heating, lighting and sound system. The stained glass feature and wood panelling is a focal point of the funeral home near where the coffin reposes. The entrance to the Funeral Home is decorated with photographs that connect us to our area and the people who live here. The reposing area of the Funeral Home is decorated with a specially designed panel which features a Celtic Cross with a stained glass centre. It reminds us of the rich and long traditions of our people — a tradition that never sees the cross on its own — but always against the light of hope, continuity and new life. 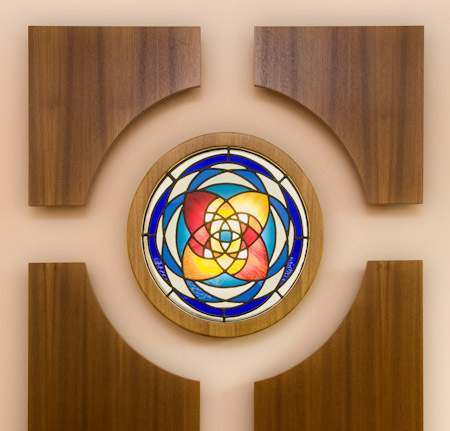 The interleaving circles of the stained glass offer a sense of movement, of connectedness and timelessness. The Celtic Cross is our most recognisable symbol across the world. It has been used to model headstones, churches, buildings, souvenirs and designer ornaments. The cross is a universal symbol but the Celtic Cross is our symbol for Christianity made local! The wood panelling was carved by John Collins and the stained glass is by West Cork artist Geoff Greenham.